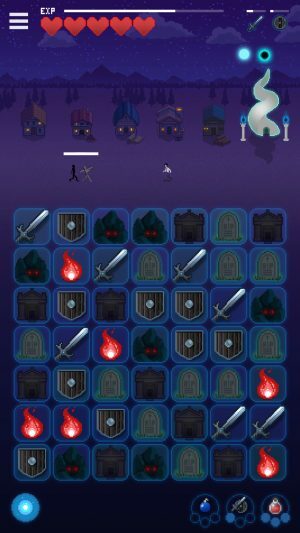 Gridland is a really nifty browser-based puzzle game from Michael Townsend, the original creator of A Dark Room ($1.99). It merges aspects of survival games, clickers, and match-3 puzzlers into one neat package that will likely absorb at least a couple of hours of your time before it feels like its hand is fully played. It’s free, saves your progress, and it even works in mobile browsers. 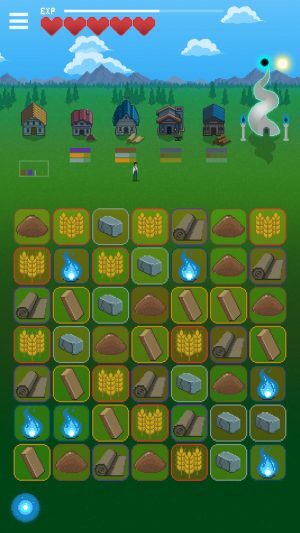 Super Gridland ($1.99) is the same game, albeit considerably gussied up in terms of presentation. It’s just as fun as it ever was, even if it doesn’t really make a strong case for itself as a separate app from the browser version. In Gridland, you start with a grid of symbols representing a few different resources. 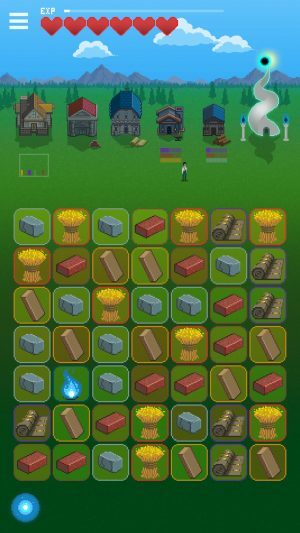 Swap tiles to make matches, and your character will start building things. As you construct and upgrade your village, new resources will become available on the grid, giving you access to even more buildings and upgrades. Of course, the more different kinds of symbols you have in play, the harder it is to make combos with each match. Getting the most out of each move becomes quite important as you work your way through the game, as every move pushes time forward a little bit. When the sun sets, the grid changes. The symbols become swords, shields, monster lairs, and more. Matching lairs will bring out a monster that you’ll have to fight and kill. The swords and shields are the tools you’ll need to do that job. The monsters aren’t shy about hitting back, though, and if you run out of hit points, you’ll be sent back to the beginning of the day. At night, time passes when you match a monster lair. You pretty much have to keep pressing on if you want to see the sun rise again and the safety that it brings. Enemies will sometimes drop useful items that you can fire off at any time. Managing these items is one of the keys to surviving in the long run, along with judicious use of your limited magic abilities. Killing monsters earns you experience points which you use to level up, extending your life bar. Your equipment improves as you uncover new resources, but you’ll also end up unearthing a mess of new monsters along the way, too. You have to be careful to keep things in tight balance lest you bring out the real nasties before you have the means to cope with them. Even with things in balance, you have to be very careful not to spawn too many enemies at once unless you’re holding onto an ace of some kind. The detail that makes this all work as well as it does is that when day turns to night, each piece will reliably turn into a corresponding night piece. You need to harvest materials to grow your town, but you don’t want to leave yourself without any swords and shields for the night. Harvesting certain materials might do nothing for you at the moment, but they’ll become dangerous creatures at night, so you spend a precious move matching them to mitigate risks. Big combos are great during the day, but at night, a single reckless cascade can end your life. Essentially, what’s good for the grid during the day isn’t always good during the night. It’s vital that you watch the sun carefully and prepare things a little before it sets. It’s a nice contrast. You’ll spend the day making matches near the bottom of the board, trying to set up big combos, and generally going about things in a safe, carefree way. The nights force you to play in almost the opposite fashion. You have to take each move carefully, planning ahead for swords and shields to replace whatever you’re currently wielding when they break. You’ll hang near the top of the board, trying to set off enemies at a slow pace. You’ll watch that moon like a hawk, not because you need to prepare for what comes next, but because of the relief that comes from surviving the night. The game saves at the beginning of each day, and you can try over from there as many times as you like. You just have to survive the night. Just a few more moves without anything going wrong. Gridland has something of an end state, but it will let you keep on going after that if you’d like. You can also do a New Game+ where you keep your level but otherwise start from scratch. Unfortunately, replayability isn’t one of the game’s strong points. The whole thing becomes routine alarmingly quickly, and it’s possible you’ll be bored pulling off the same old strategies even before you get to the end. Super Gridland offers up some extra difficulty settings to try to give you a reason to play it more than once, at least. The problem is that as you go along, the enemies move in fairly tight lock-step with your character’s advancements. It never really feels like you’re going anywhere as a result. It’s absolutely worth it to stick it out to the end, because it’s quite cool. Beyond that, it’s hard to imagine going back to this game all that often. Super Gridland features more colorful, detailed graphics than the browser version, along with new music. To tell the truth, I kind of preferred the simpler visuals of the browser version, but the new music is pretty catchy. Both of those are going to come down to your individual tastes, though. I feel like the new UI makes it a little hard to see where your resources are at if you’re playing on an iPhone, which isn’t so great. Apart from that, there’s the aforementioned difficulty setting, some sound options, three save files, and upon clearing the game, a New Game+ mode. You’ll also get to see a number of interesting stats when you finish the game, giving you a target to try to beat on subsequent plays, if nothing else. No leaderboards, Game Center or otherwise, unfortunately. It’s also worth mentioning that the game doesn’t offer a lot of guidance, so if you’re the sort that wants or needs it, you should probably stop by the thread in the TouchArcade forums. While some might prefer the new aesthetics and a stand-alone version of an app does have merits in and of itself, it’s hard to make a strong case for buying Super Gridland over simply playing the browser version on those qualities alone. I choose to look at this as an opportunity to pay Townsend for the fun I had with the browser version of Gridland, with Super Gridland serving as something of a bonus. 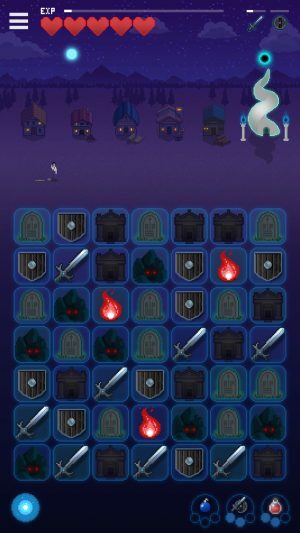 You’ll certainly get your value out of the money spent, even if it doesn’t offer quite the same impact or replay value as some other games in the genre on iOS.